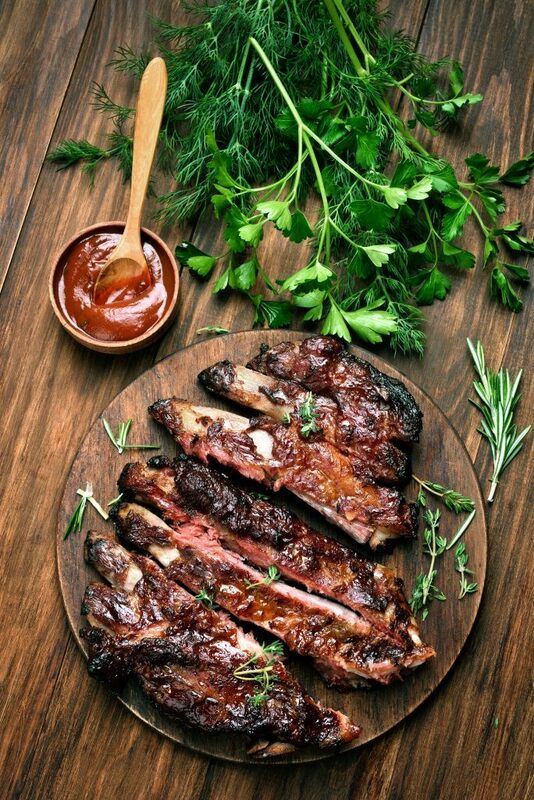 Beef ribs are sourced from cows (cattle). Pork ribs come from pigs (hogs). To understand the different types of cut for beef and pork ribs, consider the points listed below. 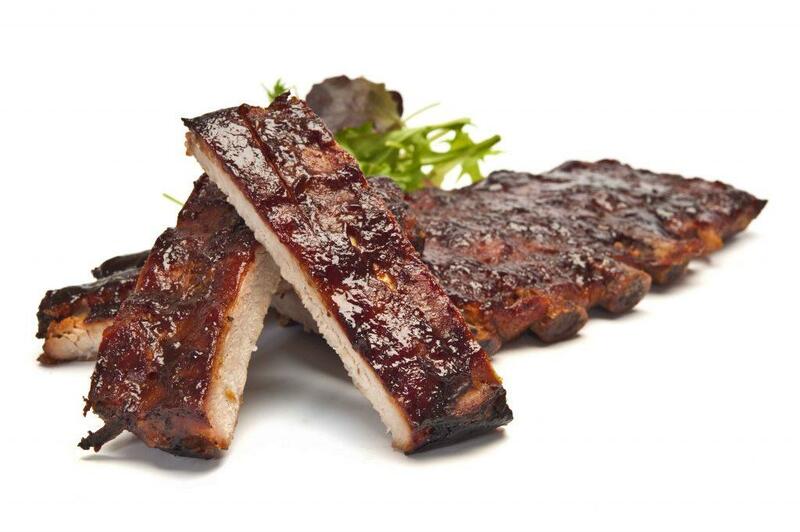 Back ribs – The side of a cow is the rib section of said animal and the source of back ribs. Its location is very similar to the location of back ribs in pigs. This type of rib is not very meaty, but is rather quite bony. Short ribs – Short ribs are sourced from the lower part of a cattle (around the chest area and below). This part is also called the plate part of a cow and is a very meaty part. Back ribs – This cut is sourced from the back part of a pig (the loin section). Back ribs are trimmed of loin meat to get close to the bones. St. Louis ribs – Rectangular in shape, St. Louis ribs are trimmed of meat to reveal the bones. Beef ribs take about 1 to 2 hours to cook. When roasted or grilled, beef ribs can seem tougher than pork ribs. Short ribs take some time to cook and are best cooked at low, steady heat for long hours (slow cooker). Pork ribs can be fully cooked in about 1 to 2 hours. Pork ribs get more tender as the dish cooks. When cooking pork ribs (especially without sauce), overcooking the meat can make it dry and tough. Beef and pork have different tastes. Refer to the points I listed below with regards to this. 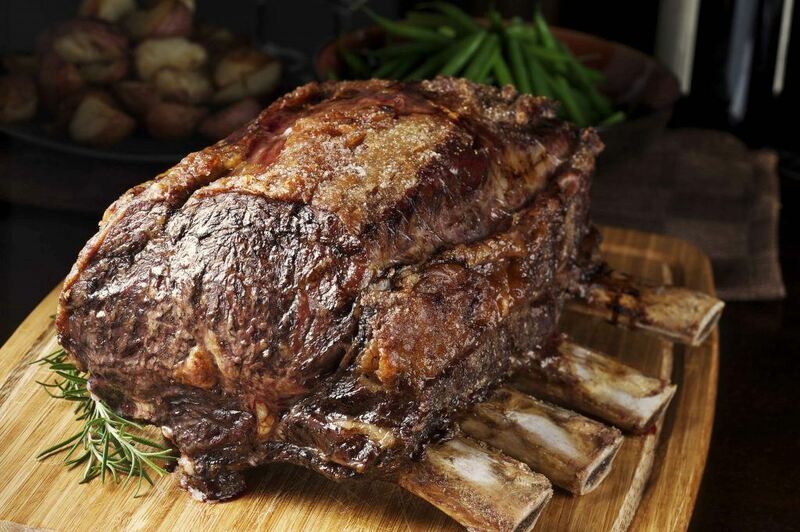 Beef – Beef ribs, like cow meat (steaks) carry that familiar red meat flavor. Compared to pork, beef is more flavorful – and putting seasonings on a dish will further enhance its taste. Pork – Pork ribs (like pork meat, in general) carry a mildly sweet flavor that can be enhanced with seasoning. Just rubbing pork ribs with salt and pepper will bring out its natural flavor. Beef – Beef ribs, coming from bigger animals, are bigger than pork ribs. Pork – pork ribs are smaller than beef ribs. 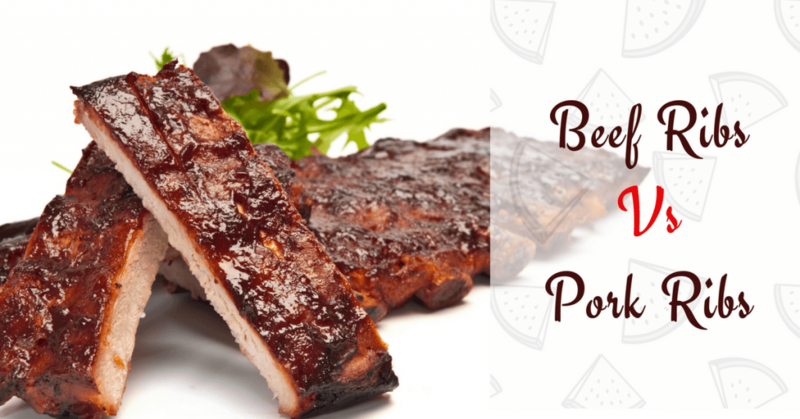 Beef – The fat content of pork ribs helps in adding more flavor to a dish. It is not necessary to remove the fatty layers from the meat. Pork – The fat content of pork ribs is high in cholesterol. It’s advisable to remove some of the fatty layers before cooking the dish. Q: Which is healthier, beef or pork ribs? A: If you’re asking about the nutritional value of beef ribs and pork ribs – well, they’re quite the same. Their main difference is in the taste, but you can actually cook these beef and pork parts in different ways to achieve a variety of tasty results. Q: How can I tell if ribs are beef or pork? A: It’s really easy to tell if a rib part is beef or pork. When looking at raw meat, check to see if it’s red (beef) or pinkish white (pork). Now, when looking at cooked meat, note that beef meat is darker in color (dark brown) than pork meat (light brown). Q: How can I tell the difference between beef ribs and pork ribs? A: As explained in the sections above, beef ribs and pork ribs have different sizes, colors, and tastes. Q: How do you compare the cooking time of pork ribs vs. beef ribs? A: Depending on the recipe, beef ribs and pork ribs have almost the same cooking time. Q: What are beef ribs called? A: As discussed above, beef ribs have 2 major cuts – back ribs and short ribs. Meat is found between the bones in back ribs. In short ribs, the meaty flesh is found over the bones. Q: Are spare ribs pork or beef? A: Normally, pork ribs are referred to as spare ribs. This is almost always the case – but sometimes (very rarely), beef ribs are also called spare ribs. Q: What animals do ribs come from? A: For food, we get pork ribs from pigs and beef ribs from cows. Brown the pieces of beef ribs in a pan. 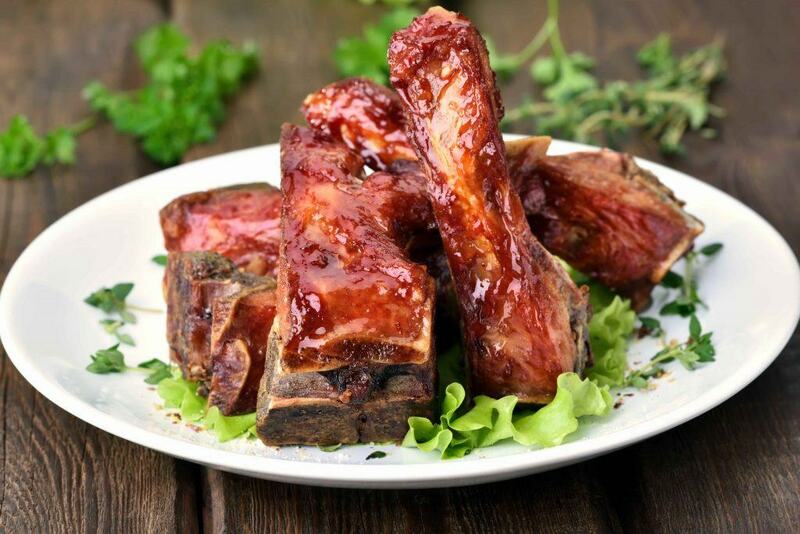 Cook the ribs in a mixture of red wine, tomato puree, stock, and whole garlic (cut in half). Finish in the oven by cooking for about 2 hours (at 350 degrees Fahrenheit). Top with fried bacon and mushrooms. Boil the beef short ribs. Add the vegetables (this particular recipe uses potatoes, carrots, cabbage, green beans, squash, corn, etc.). As you can see, just preparing the vegetables can take a lot of time. It’s a lot, and you need to cut them all for the soup (so please be patient and just think of it as making healthy food, ok?). Boiling the ribs also requires at least 2 hours – so, again, be prepared for the task. Season the slabs of beef back ribs. Allow the seasoning to get absorbed by the meat for at least an hour – but allowing it to marinate in the seasoning overnight is even better. Wrap the beef rib slabs in a foil and place over direct heat (about 400 degrees Fahrenheit). Grill each side for about 5 minutes each. Remove from foil and serve with side dish (mashed potatoes would be a good idea). Remember, you want to cook the ribs well so that it’s not chewy. Also, the success of this recipe will depend greatly on how long you let it soak in seasoning – so, I really suggest marinating it overnight. For a quick but yummy pork spare ribs recipe, I really urge you to try this one. It’s not that hard to cook, as you will see in the steps below. Put some oil in a frying pan (Amazon) and brown the spare ribs. Remove from pan and set aside. In the same pan, fry some garlic and ginger before adding back the ribs. Add oyster sauce and sugar. Add some water and let it simmer for about 15 minutes. When almost done, add green onions. If you like your ribs sweet and salty, you should really try this recipe. It’s best served with rice and soup (for a complete meal). If you’re like me, you want your baby back ribs to be fall-off-the-bone tender – and that’s what this recipe is. You have the option of cooking this dish on the grill or in the oven – but for now, it’s done in the oven. The steps to making this recipe are simple to follow, as you will see below. Prepare the baby back ribs by removing the thin membrane near the bones and cutting the whole slab into pieces (1 rib per piece). Drizzle and rub with lemon juice (for tenderizing). Press and coat the ribs with the rubbing mixture. Arrange in a baking pan (Amazon) and cook at 300 degrees Fahrenheit for about 2 ½ hours. Coat the ribs with sauce and cook each side for about 5 minutes each. Use the Broil function in your oven for this step. Well, now you know how to tell beef ribs and pork ribs apart, right? As you can see, they are very different not only in appearance but in taste as well. Personally, I enjoy eating both beef and pork and can appreciate the taste of different types of ribs. 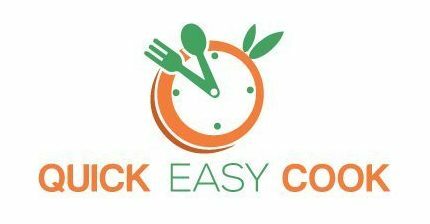 If you love cooking, I suggest trying the recipes I included in this post. This way, you will appreciate beef ribs and pork ribs even more. If you found this article useful, feel free to share it with your friends. Any feedback from you will also be highly appreciated.